This drill is the perfect guide to optimizing the cross-linkage between your eyes, your brain and the movements that you have to be able to execute in order to become a prolific, quick-thinking athlete. 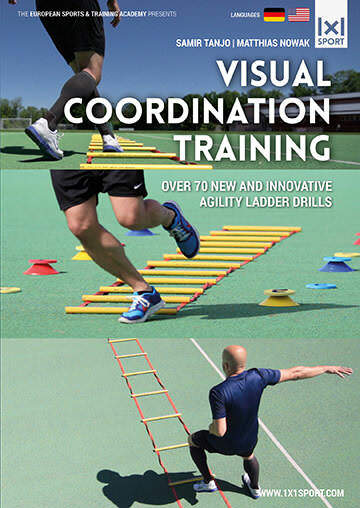 Set up an agility ladder and place colored and numbered cones (or any other items) left and right of it. For your first try, move through the ladder with some easy steps. Later they can (and should) get more complex. As you run through the ladder you shout out the colors and numbers in the correct order. If you want an even more challenging drill, you can add other movement tasks as well (e.g. clapping).